Heston from Waitrose The Chocolate Scotch Egg looks from the outside to be a traditional summer favourite, however on closer inspection, chocolate-lovers will be delighted to discover a sweeter alternative; a zesty mango and yuzu fondant yolk is encased in a smoked milk chocolate caramel ganache in the shape of an egg and coated with milk chocolate, maple-crunch breadcrumbs. 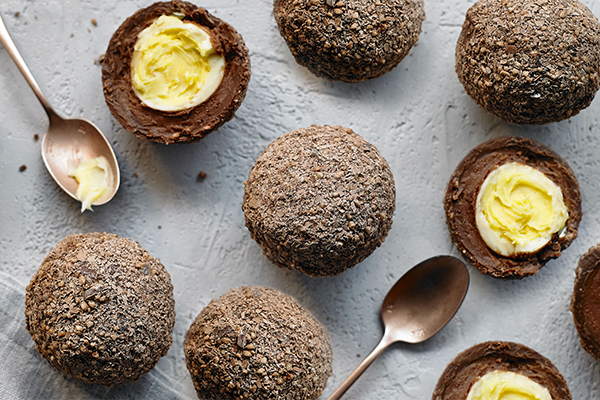 A must-have for an Easter picnic or party, Heston’s Scotch egg has a mango and citrussy yuzu fondant ‘yolk’, wrapped in a delicately smoked milk chocolate caramel ganache ‘meat’ that is then topped with milk chocolate maple crunch breadcrumbs. Heston from Waitrose The Chocolate Scotch Egg £6/110g will launch in Waitrose shops from March 2019.